Prokletije or the Albanian Alps are a mountain range in the Balkans that extend from northern Albania to Kosovo and eastern Montenegro. Their highest point, Jezercë in Albania at 2,694 meter (8,839 ft), is the tallest peak in the entire Dinaric Alps. Both the highest peak in Montenegro, Zla Kolata at 2,534 meter (8,314 ft) and the highest in Kosovo, Đeravica at 2,656 meter (8,714 ft), are located here. The highest peak in Albania, however, is Mount Korab, which is 2,764 meter (9,068 ft) high and is located in the east of the country on the border with Macedonia. The southernmost glaciers in Europe were recently discovered in the Albanian part of the range. The regional economy is based mainly on agriculture, immigrant remittances and tourism. There are three national parks in Prokletije, one in Montenegro and two in Albania. 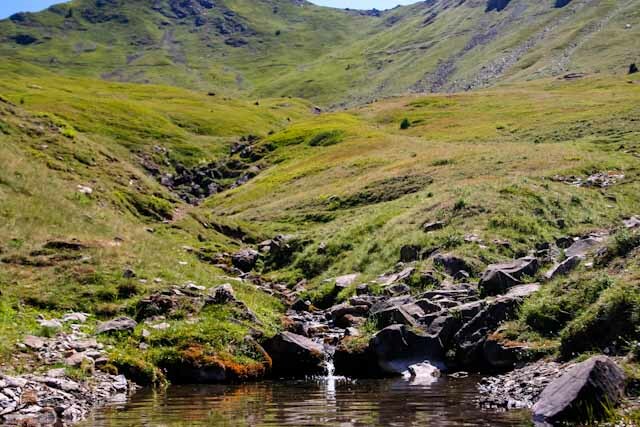 A fourth national park has been proposed for Kosovo. The Theth National Park in Albania was designated in 1966 and covers an area of 2,630 hectares along the Thethi River. The main attraction in the park is the Grunas Waterfall. The Valbona Valley National Park in Albania was also designated in 1996 and covers 8,000 hectares including the Valbona Valley and the Valbona River. This park is also referred to as the Gem of Albania. Kosovo, Albania, and Montenegro are planning to create another tri-state park in the area, that will be called Balkanik Park of Peace. There are also plans to implement a large National Park in Albania, which would cover a massive area of 144,000 hectares. 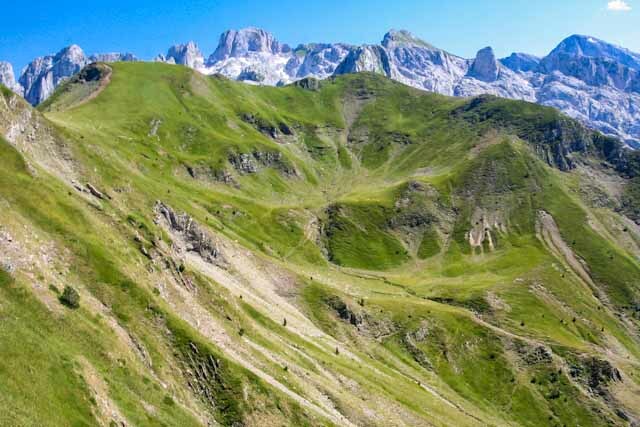 The park on the Kosovar side would include an area of 50,000 hectares, covering the high alpine areas as well as the Rugova Canyon and important rivers. 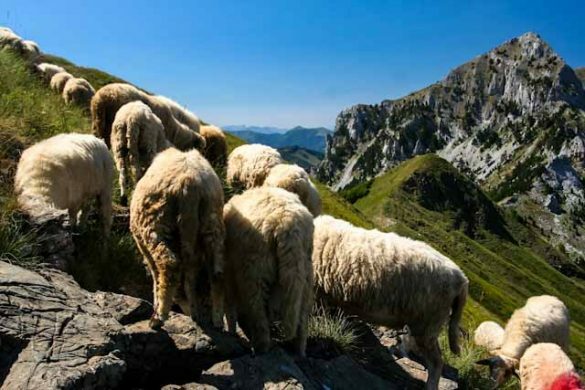 The Montenegrin part of the Prokletije range was declared a national park in 2009, comprising an area of 16.000 hectares. A part of Maja e Ropës mountain was declared a floral mountain reserve in 1955, covering an area of 25 hectares of mainly Macedonian Pine, pine and beech. In the same year the Kozhnjar area was declared a fauna reserve in particular to protect the chamois, covering an area of 161 hectares. Illegal deforestation is still a major problem today. To some extent even the national parks are affected. In dry summers forest fires are common. All the large mammals including wolves, chamois, foxes, badgers and wild boar are hunted without regard to national park boundaries. The Prokletije mountains, the southernmost part of the Dinaric Alps, stretch more than 40 miles from the Skadarsko Jezero along the Montenegrin–Albanian border in the southwest to Kosovo in the northeast. The southern boundary of the Prokletije is found at the river Drin and its tributary Valbona. In a broader sense the Prokletije also include the mountain ranges to Mitrovica with the Hajla and Mokna massifs. Some authors, however, see the river Lim as the northern boundary of the Prokletije in geological terms. From the Skadarsko Jezero lake, the mountains stretch northeast along the Cijevna river area, then curve slightly to the east in the direction of Đeravica summit above Metohija (450 meter) basin in Kosovo. From here, the Prokletije turn northwards over the Bogićevića massif and Čakor pass, and continue with another row of mountains. The Prokletije finish in the area of upper Ibar river valley near the city of Kosovska Mitrovica, just after the Suva Planina (1,750 meter) massif that encircles Metohija basin from the north and northwest. The Prokletije are ethnographically and sociologically diverse due to many tribes living in the region as sheep herders. Names of various tribes – Hoti, Gruda, Kelmendi, Kastrati, Dukagjini, Shkreli, Shala, Nikaj, Krasniqi, Gashi and Rugova – refer to their geographical locations within the range. The Prokletije are a subrange of the 1,000 km (621 mi) long Dinaric Alps. The Prokletije are a typical high mountain range with a pronounced steep topography and glacial features. Absolute relief energies of 1800 meters are found in the Valbona, Grbaja and Ropojani and Cijevna valley. Overhanging walls and ridges forming pointed peaks are typical of the western and central Prokletije. The eastern mountains are less rugged prior to milder forms of relief. The valleys are characteristic of strong Pleistocene glaciation. Most of the area was formed by glacial influences with karstic areas in the western parts. The range was formed by the folding actions of the African Plate, which lies under the European Plate. Nowhere in the Balkans have glaciers left so much evidence of erosion. After the Alps, these mountains are the most glaciated in Europe south of the Scandinavian ice sheet. They have very steep slopes made out of limestone and are the most karstic mountains in the Balkans. The Prokletije is a large, rugged, pathless and hardly passable range. It is one of the rare mountain ranges in Europe that has not been explored entirely. In some areas, the Prokletije run almost parallel with the Šar Mountains in Macedonia, Albania and Kosovo. This tectonic crash produced the unusual zig-zag shape of Prokletije range, and also their curving from the dominant Dinaric northwestern – southeastern direction toward the northeastern one. In the western and central parts of the range the composition of the mountains is of mainly uniform with Mesozoic limestones and dolomites of the Jurassic and Cretaceous Ages. In the eastern Prokletije in addition to the limestone and dolomite series, there are rocks from the late Palaeozoic and Triassic periods, medium-Triassic volcanic rocks and Jurassic metamorphic rocks. Didn’t the old legend told, when god had created the earth, he flown over it with 3 bags who carried earth, seeds, and rocks. Every country got his share. Untill the devil suddenly appeared and cutted the bag filled with rocks. The country were the rocks were tumbling on would be known as Montenegro. The Kalktafel of Prokletije is cut deeply with valleys in a variety of powerful rock blocks cut by the mountains north of Përroi i Thatë, the Biga e Gimajive south of it, the Jezerca block between Shala and Valbona valley, the massif of the Maja e Hekurave, the plateau of the Maja e Kolats north of Valbona and Shkëlzen northeast of Valbona. The valleys were formed by Ice Age glaciers, which created very steep walls and hollows up to 1000 meters deep. The south wall of the Maja Harapit is 800 meters high, making it the highest rock face on the Balkan Peninsula. Although there some serious scientific research gives the Prokletije the status of a separate mountain chain, in most other ways this chain is still considered the highest of all Dinaric areas, connected with the Dinaric mountain chain in terms of geology, morphology, and ethnography. The erosion of the Prokletije mountains by glaciers left many telltale features behind. Deep river canyons and flat valleys wind around the ridges of the mountains. The largest and most popular canyon is Rugova Canyon. It is situated in Kosovo and is 25 kilometer (16 mi) long from the border with Montenegro to the city of Peć and is 1,000 meter (3,281 ft) deep. It has very steep vertical mountain slopes on both sides. Valleys common at lower altitudes are also found at the alpine level, creating mountain passes and valley troughs. The most well-known valley to be high up in the mountains is Buni Jezerce in Albania. Buni Jezerce means “Valley of the Lakes” and it contains six small glacial lakes, the biggest being called the Big lake of Buni Jezerce. The Prokletije is on the whole the wettest area of Europe. In the village of Boga in the dry valley, precipitation is 3,033 millimetres (119.4 in) per year, and otherwise 2,000 millimetres (79 in) to 2,500 millimetres (98 in) per year is normal. At higher elevations snow is found even in summer, except in very dry years. 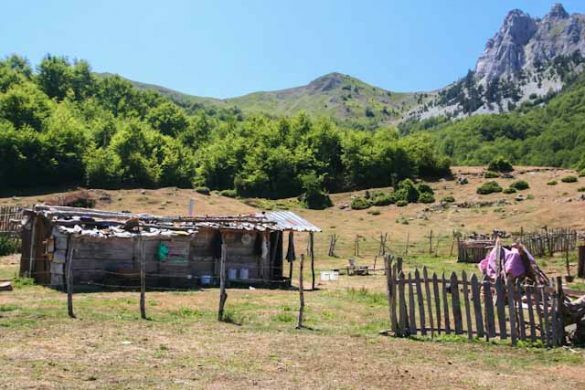 In winter some villages in the Albanian part of the Prokletije are completely cut off from the rest of the world for months due to the very heavy snow. Today on the shady northern slopes of the Prokletije, there are at least five active glaciers that probably formed during the late Holocene period, as well as a number of inactive glaciers between 1,980 and 2,420 meters high. 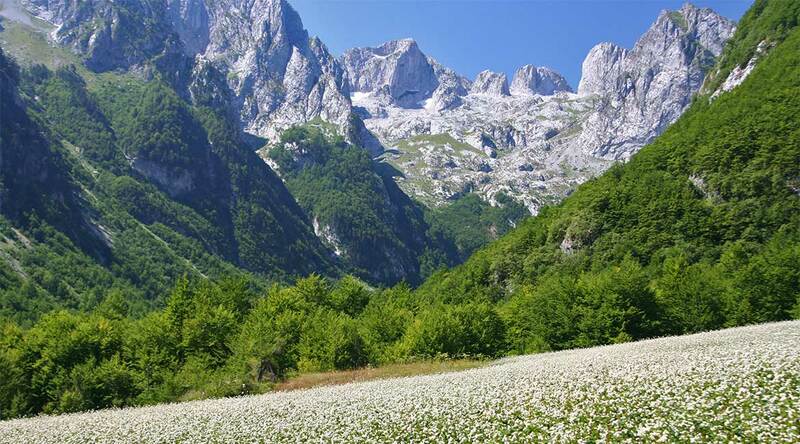 The trough valleys of Ropojani, Grbaja and Valbona were carved by miles of glaciers during the last Ice Age. Detailed geomorphological mapping was used to reconstruct the positions of former glaciers. The longest glacier of Ropojana had a length of 12.5 kilometres (7.8 mi) and a surface are of 20 square kilometers (7.7 sq mi); others include Valbona glacier at 9.5 kilometres (5.9 mi) and 10.5 square kilometres (4.1 sq mi)), Grbaja Glacier at 5 kilometres (3.1 mi) and 6.7 square kilometres (2.6 sq mi) and Bogićevića Glacier at 6 kilometres (3.7 mi) and 6.9 square kilometres (2.7 sq mi). In addition about 20 small lakes of glacial origin are found as described above, among them the lake group Buni i Jezerce to the north side of Jezerca, the Ridsko Lake, Lake Bukumisko and Rikavacko Lake. A recent report from geographers at the University of Manchester details the discovery of four previously unknown glaciers in the Albanian part of the Prokletije range at 1980–2100 m high, found in the area close to Maja e Jezerces. The glaciers, the largest of which is currently the size of six football pitches, vary in size every year according to the amount of winter snowfall and temperatures during the following summer. Their average total surface area is 5 hectares (0.019 sq mi). Glacier-climate modeling suggests that these glaciers require annual accumulation of between 4,137 millimetres (162.9 in) and 5,531 millimetres (217.8 in) (rainfall equivalent) to balance melting, which would correspond to between 49.7 metres (163.1 ft) and 66.4 metres (217.8 ft) of snow. A significant proportion of this accumulation is likely to be sourced from windblown snow and, in particular, avalanching snow. It is estimated that the total accumulation needed to balance melting is potentially up to twice the amount accumulated from direct precipitation. The presence of these glaciers, the southernmost in Europe, at altitudes well below the regional snow line highlights the importance of local controls on glacier development. The geographers think at least eight glaciers were present in neighbouring mountains during the 19th century, correlating with the culmination of the ‘Little Ice Age’ in the European Alps. The vegetation of the Prokletije is among the richest on the Balkan Peninsula and one of the main central European regions for flora. To date, 1611 wild plants have been described in the Albanian part alone. In total, 50 flora species are endemic, sub-endemic and endangered plant species. The southern edge of mountains have a sub-Mediterranean character. Various evergreen bushes are found in the deepest valleys of the canyons and sunny slopes, and in the higher valleys deciduous Shibljak shrubs are common. In the mountains over 100 medicinal herbs are found, including species of the genus Primula, Satureja and Sideritis. Because of its altitude and its favored habitat, the range is one of the centers of arcto-alpine relict flora of the Balkan Peninsula. Out of 77 arcto-alpine species of former glacial flora on the Balkan Peninsula, a little over 50 species can be found in the Prokletije. The levels of vegetation in Prokletije meet the alpine level, from upland valleys through the montane mountain stage on forest-free alpine and subalpine mats and subnivale tundra caused by permafrost in vast heaps of rubble with raw soils. A real snow level is not widely spread, although in the high altitudes snow and fern fields can also keep during the summer on four very small glaciers at high altitudes, the highest one found in the shade of Jezerca. Beech, fir and silicate spruce forests dominate the mountain areas. These forests of beech Fagus sylvatica consist mostly of white fir. Rarely, however, the Northern Europe species are found, typically the Scots pine Pinus sylvestris. The drought-resistant Mediterranean-sized black pine Pinus nigra is also common. Aspens Populus tremula grow in damp sites alongside mountain maple Acer pseudoplatanus and Norway spruce Picea abies. The Prokletije is one of the southernmost areas where spruce grow in Europe. The “combat zones” of the forest are formed with dense thickets of mountain pine Pinus mugos. Conifers like the snakeskin pine Pinus heldreichii are located on carbonate rocks and the Macedonian pine Pinus peuce of silicates are typical elements of the endemic Balkan flora. These are of special interest for natural history. A cushion-sedge and blue grass lawn of Seslerion juncifoliae grows in alpine areas and, on shallow limestone soils, Oxytropidion dinaricae, to which the alpine grass Krumm grows as in the Alps. Other plants include Alpine Aster alpinus Aster, Edelweiss Leontopodium nivalis and White Mountain Avens Dryas octopetala. These plants are atypical alpine plants specially adapted to the short growing season, UV radiation, cold and thin soils. The flora in the rocky areas of the Prokletije are particularly noteworthy, because they are rare rich and endemic species, including the Tertiary relic Amphoricarpos neumayeri. Many species of flora are either endemic or are found in the Prokletije. A plantain plant Plantaginaceae is found in the central Prokletije as a variant of the alpine Wulfenie, but 700 km away it does not grow. Petasites doerfleri is only found on the Jezerca peaks, and the Albanian lily Lilium albanicum and Viola ducagjinica are only found at the top of the Maja Radohimës slope. Also noteworthy is the Viola vilaensis Hayek. Viola chelmea belong to a violet species that occur on the Montenegrin-Albanian border area, especially at the lake Bukumirsko Jezero at 2,100 meters, and are only found on Asia Minor and the Balkans where they can grow due to woody, robust rhizome, cleistogamous flowers, and a lack of foothills. The Prokletije is also the only European area where the Tertiary relic Forsythia europaea grow. Large mammal species that have long been extinct in other regions are found here, such as the Eurasian brown bear, grey wolf, red fox, European wildcat, roe deer, fallow deer, red deer, wild boar and European otter. The highly endangered Balkan lynx, a subspecies of the Eurasian lynx, is mainly found in the Thethi National Park where about roughly 20-50 individuals still roam, though poaching is still a large threat. Chamois are found throughout the high altitudes. About 720 chamois live between the borders of Kosovo and Montenegro alone. There is speculation that the mouflon roamed the Prokletije until World War I, when it disappeared. Bird species include the golden eagle, snake eagle, honey buzzard, peregrine falcon, capercaillie, rock partridge, scops owl, Eurasian eagle owl and the snow finch. The rivers are home to a growing number of Marble trout. Among the amphibians are the alpine salamander, fire salamander, yellow-bellied toad and fire bellied toad . The rich herpetofauna include the fence lizard, green Lizard, Greek tortoise and snakes such as the true vipers, including the poisonous horned viper and adder. So far 140 species of butterflies have been found, which makes Prokletije the richest area in Europe for butterflies. The Prokletije have one endemic species of lizard, the Prokletije Rock Lizard or Dinarolacerta montenegrina, named after the range. According to the laws that apply to national parks in Montenegro to preserve the natural resources and cultural heritage of the parks, no new projects may be started. An exception to this is only for existing foundations on which a new project may be realized. For the Prokletije park it means that no accommodation is available in the park itself. This is due to the unpopulated and unspoilt and wilder nature of the mountains in which even asphalted roads can not be found. The places Plav and Gusinje are the cities that lie in the vicinity of the massif. The cities themselves are both small in size and touristy themselves are also not very developed. Plav with it’s Plavsko Jezero, the largest lake in the area, is the larger attraction. Guest House Merak – Featuring free bikes, Guest House Merak offers accommodation in Gusinje with free WiFi and mountain views. The property offers views of the garden. The holiday home comes with 3 bedrooms, a TV with cable channels and a fully equipped kitchen with oven and microwave. A continental breakfast is served every morning at the property. The holiday home has a barbecue. Distance : Located 10 km from the park. Facilities : Free Wi-Fi, Free parking. Terrace, Outdoor furniture, Balcony, BBQ facilities, Bikes available (free), Mountain view, Ironing facilities, Free parking, Mini-bar, Tea / Coffee Maker, Free-standing. Eko Katun ROSI – Boasting a garden and terrace, as well as a restaurant, Eko Katun ROSI – Old Tower is located in Gusinje. This 3-star hotel features free WiFi and a shared lounge. The rooms are equipped with a balcony. The rooms at the hotel are equipped with a seating area. With a private bathroom fitted with a bath and a hair dryer, some units at Eko Katun Rosi also have a mountain view. All units will provide guests with a microwave. A continental breakfast is available daily at the property. Cycling is among the activities that guests can enjoy near the accommodation. For any tips on how to get around or what to do in the area, guests can ask at the reception. Distance : Located 7,6 km from the park. Facilities : Outdoor furniture, Terrace, Garden, Restaurant, Breakfast in the room, Free Wi-Fi, Free parking, Walking tours (Additional charge), Horse riding (additional charge), Private check-in/check-out, Airport shuttle (additional charge), 24-hour front desk, Room service, Mini-market on site, Facilities for disabled guests. Our four things we recommend to see or do when visiting Prokletije's national park.